Published: June 25, 2014 at 10:16 a.m. Updated: June 25, 2014 at 11:47 a.m. Recruiting is the lifeblood of college football programs and responsible for winning games just as much as the NFL draft is for every team in the league. With a recruiting cycle that has stretched earlier and earlier, coaches are tasked with developing relationships with teenage phenoms longer than ever and selling them on their program. College Football 24/7’s 14 for ’14 series continues with a look at some of the top recruiters in the game in recent years. A Bulldog through and through as a second generation running back for Georgia, McClendon is a youthful addition to this list, as he's made a big impact for the program in recent years. He's done great work in and out of state and most notably landed both Keith Marshall and Todd Gurley in the same recruiting class, doing a great job in 2014 despite staff turnover in Athens. Fellow coach and new defensive coordinator Jeremy Pruitt coming to town gives Georgia one of the best one-two punches in recruiting. Head coach Art's son has quickly developed a reputation separate from his father by becoming one of the top young recruiters in the country. He's assembled one of the deepest and most talented wide receiver corps in the country over the past few years and has gone head-to-head with Texas, Texas A&M, Alabama and others and come out on top for commitments. One of the best in the ACC and a key reason the Tigers have been sending a number of players to the NFL, Scott has been able to haul in an impressive number of blue chippers over the years. He's in charge of Clemson's overall recruiting but has done a particularly good job of reeling in players along the East Coast from Virginia to Georgia to Florida. Beaty knows the state of Texas, and particularly the recruiting rich Dallas/Ft. Worth area, extremely well from his days as a high school coach and assistant at Rice and Kansas. He flipped several commitments as soon as he came on board the Aggies staff in 2012 and continued to lock down four- and five-star players as an integral part of what has become a recruiting machine in College Station. The Crimson Tide have recruited at a level college football hasn't really seen over the past few years and Smart is one key reason why. You could pick a number of folks on the Alabama staff who could be on this list, but most of them are heavily influenced by Smart. He did a great job in landing five-star freshmen like Rashaan Evans and Marlon Humphrey in 2014 and might have commitments from more top defensive players in his career than just about anybody. It's hard to be more of a Seminole than Haggins is, but the veteran coach has stayed in Tallahassee no matter who is in charge because of his recruiting prowess. He's one of the biggest reasons why Florida State has an imposing front seven that is as deep as any in the country, and Haggins' ability to land top players from the Mid-Atlantic to Florida is a key reason why he's one of the best. Before returning home to the Plains, Craig was one of the ace recruiters on Florida State's staff and was the biggest reason Heisman Trophy winner Jameis Winston is in Tallahassee and not elsewhere. Now he's ramping things up at Auburn and having good success against fellow BCS heavyweights like Alabama and FSU. He relates well with young players and isn't one fellow coaches want to recruit against. He moved north from Auburn to Tennessee but left behind a slew of top prospects that he brought to the Tigers that ended up contributing to a remarkable turnaround. A long-time presence on top recruiter lists, Thigpen has connected with players and families like few can. He's been a revelation for the Vols lately and is a big reason why Butch Jones and company have turned things around on the recruiting trail in Knoxville. Whether it's close to campus in Southern California or all the way out in the Southeast, Martin has a great reputation as a recruiter. Despite the regime change at USC, Martin helped keep the Trojans' recent class together and was one of the biggest reasons why the team was a huge winner on Signing Day in 2014. He's responsible for the program landing a number of out-of-state surprises but is heavily involved in just about every aspect related to recruiting. In many ways, he takes over Ed Orgeron's title as USC's top coach when it comes to securing big commitments for the future. The long-time Penn State coach has too many recruiting coups to count over the past few decades. He was instrumental in Bill O'Brien hauling in some talent despite NCAA sanctions and is perhaps the dean of elite Big Ten recruiting at the moment. The Buckeyes' staff is filled with some of the best recruiters in the country, but Johnson stands out as someone who snags top players year in and year out. Not every coach can whip out a few Super Bowl rings to show recruits, but Klemm can if he needs to thanks to his time as a member of the Patriots dynasty as an offensive lineman. He’s risen up the coaching ranks extremely quickly thanks to his ability to recruit and keeping him around Westwood is Jim Mora’s priority every offseason. He’s made UCLA a big player for elite prospects out West while also getting them into homes across the country. 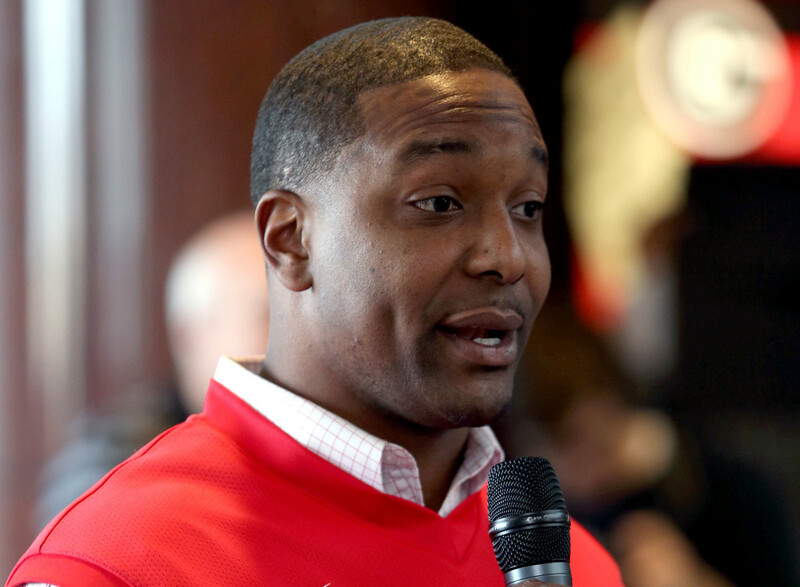 It seems like Locksley has been a mainstay at Maryland as an assistant, but he's left a mark as a recruiter at just about every stop save for the one as a head coach at New Mexico. He paid immediate dividends for Randy Edsall by landing players like stud receiver Stefon Diggs despite a 2-10 season the year before. He is close to unbeatable with Washington D.C.-area prospects and is a big reason why the Terps' program has seen an infusion of young talent as it heads off to the Big Ten.